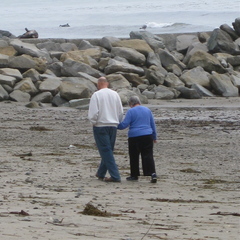 Older couple on the beach in Santa Cruz, CA. There's a generation gap in America and I want to close it. There's a generation gap in America and I want to close it. How do I plan on doing so? By starting the Stories Project, of course! The Stories Project includes stories, interviews, and discussions with and about members of the older generations gathered by members of America's younger generations. It aims to improve communication, enkindle understanding, and hopefully create a climate of rapport between young and old in America (and the world!). I talk to 82 year old Midge Bemel. The following is an excerpt from my interview with the late, great Martina Watkins. I talk to 98 year old Martina Watkins. What is the Stories Project? What is the Stories Project and what inspired it?